The Law of Influence dispels the misconceptions of leadership and explains the true measure of leadership. The true measure of leadership is influence-nothing more, nothing less. John Maxwell puts it very plainly, "If you don't have influence, you will never be able to lead others." The misconceptions of leadership are numerous. Just because you have a title or position doesn't mean you can lead. As Maxwell explains, "Titles don't have much value when it comes to leading. True leadership cannot be awarded, appointed or assigned. It comes only from influence and that cannot be mandated. It must be earned. The only thing a title can buy is a little time - either to increase your level of influence with others or to erase it." So what are the misconceptions or myths about leaders and leadership? There are five common myths and misconceptions about leaders and leadership. A common misunderstanding is that leading and managing are one of the same. Leadership is about influencing people to follow; whereas, management is about maintaining systems and processes. As Maxwell writes, "The best way to test whether a person can lead rather than just manage is to ask him to create positive change. Managers can maintain direction, but they can't change it. To move people in a new direction, you need influence. People often assume that all salesman and entrepreneurs are leaders. However, that is not true. As Maxwell explains, "People may be buying what he has to sell, but they're not following him. At best, he is able to persuade people for a moment, but he holds no long-term influence with them." We have all heard the slogan: Knowledge is Power. As Maxwell explains, "Most people, believing power is the essence of leadership, naturally assume that those who possess knowledge and intelligence are leaders. But that isn't automatically true." There are many brilliant people around the world but when it comes to leading, their IQ does not necessarily equate to leadership. People think just because you are out in the front, you are a leader. Being first is not always the same as leading. As the old adage goes, you can be out front but if there is no-one following you, then you are not a leader. 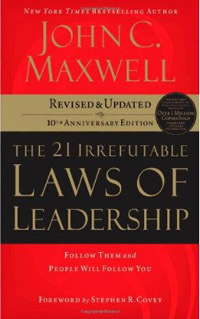 Maxwell writes, "To be a leader, a person has to not only be out front, but also have people intentionally coming behind him, following his lead and acting on his vision." Many people assume position is leadership. I have this position, this title; therefore, I am the leader. Stanley Huffty states, "It's not the position that makes the leader; it's the leader that makes the position." You may have the position of leader but that does not mean you are the leader. Leadership is influence - nothing more, nothing less. Leadership in volunteer organizations requires influence. As Maxwell explains, "In voluntary organizations, such as churches, the only thing that works is leadership in its purest form. Leaders have only their influence to aid them." As Harry A. Overstreet observed, "The very essence of all power to influence lies in getting the other person to participate." In other words, leadership is influence - nothing more, nothing less. As Maxwell concluded, "If you can't influence others, they won't follow you. And if they won't follow, you're not a leader." For more information about this subject, click on the law of influence.